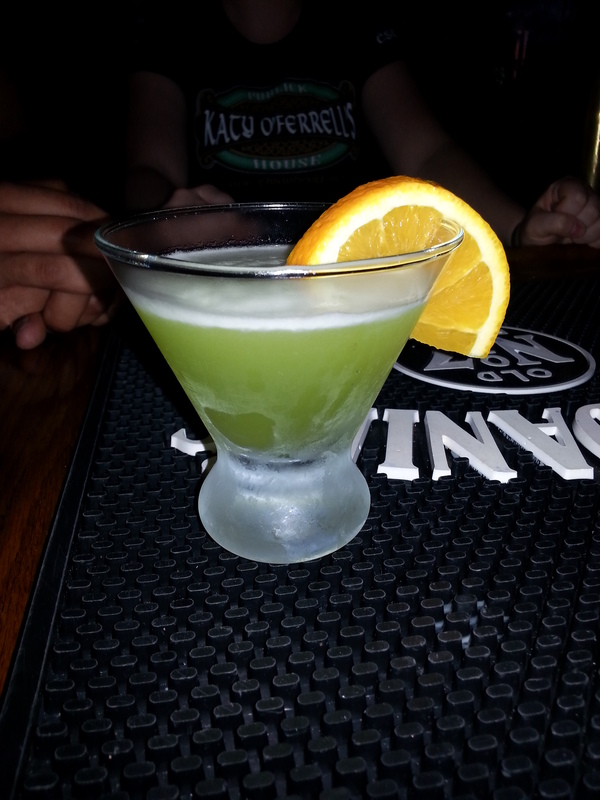 This is a very popular green martini that I found online, however the original recipe says to use grape flavored vodka. I thought grape vodka was a little too sweet so I substituted it with regular vodka. It’s been so popular that I put it on the specialty cocktail menu at work. Its great for people who want something sweet and fruity. The person who ordered this particular cocktail was a nice older lady who stayed at my bar for most of the evening. She said that she used to frequent The Royal N’orleans, which was the restaurant that used to be in the building that Katy O’s is located. She used to come in with her husband and sit at the bar, sharing a bottle of wine before dinner. They would come in on their anniversary, which was May 12th 1970. Forty-five years to the day. She told me he died seven years ago to lung cancer, and since the Royal N’orleans closed in 2009, she hadn’t been back since he died. She had heard that we opened in the old N’orleans building, and that we are an Irish pub. She decided on a whim that she was going to come in today and sit at the bar, just like her and her husband used to do. She asked for a wine list and we talked about the wine we offered for a while, Finally, she decided that she didn’t really want wine and asked me what else I could make. I showed her our speciality cocktail list and asked her what she was really in the mood for. She said that she wanted something sweet and fruity and something that would lift her spirits. I suggested the Luckytini. She fell in love and had a few more. She relived her past with her husband over the drinks, and when she was ready to leave I called her a cab. She gave me a big hug before she walked out of the door.